We are delighted to introduce you to Sue Carter, a guest contributer. Sue is a senior communications consultant whose expertise in gender communications comes from working as a journalist in women’s media, as well as developing and delivering niche communications strategy for a wide range of consumer and corporate clients. She understands how to effectively engage and influence female audiences on issues and brings a fresh and different perspective to the boardroom. 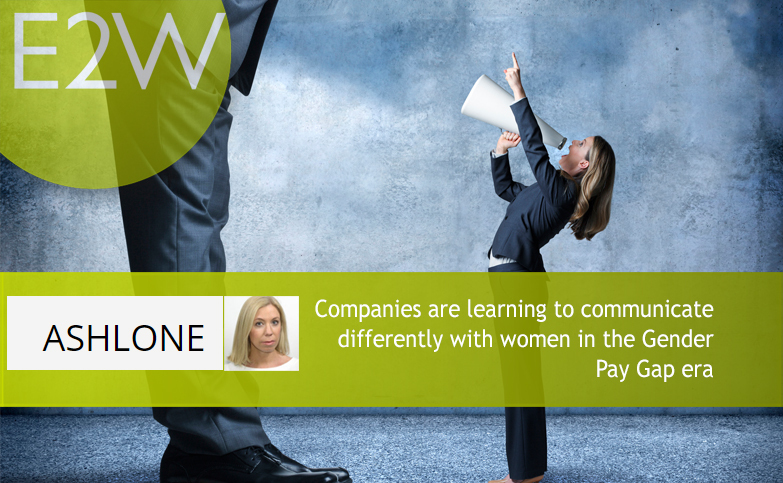 Retaining and recruiting women in the new landscape of gender pay gap requires companies develop a new understanding of the language and culture of women, and not shy away from having difficult and often personal conversations. Not an easy proposition for your average global financial services organisation. As a communications consultant specialising in gender pay gap and diversity issues, I am seeing an increase in clients realising their efforts to engage senior women via traditional corporate channels are not having an impact – as evidenced by GPG figures not improving – and there’s the beginning of panic on many levels. What is most unique about gender pay gap is what was essentially a regulatory issue for business has become a national conversation that is being debated in increasingly emotive and political language. Nor is it confined to the business pages, but it’s being championed by women’s magazines, the lifestyle pages, on radio, TV and activist social media influencers. When women discuss it, they do so within that context, and where it affects them – at the school gates, to friends and family, with peers at female networking events or groups such as the E2W community, over drinks with female colleagues, on Mumsnet; and they are expressing frustration and anger at the old City eco-system that has created this. Even the most media-savvy of the global organisations are hesitant to get involved in what they regard as ‘radioactive’ women’s issues in the media – batting away all invitations as ‘not appropriate or relevant’! In stark contrast, the new breed of confident female CEOs are fashionably embracing this new world with great success. Legal & General Investment Management’s Dame Helena Morrissey, FinnCap’s Sam Smith and the former Virgin Money CEO Jayne-Anne Gadhia (to name just a few) are blazing a trail as leaders who are as comfortable on the lifestyle and fashion pages discussing the challenges faced by working mums, male dominated City culture, and flexible working as they are on the business pages and in front of a Treasury Select Committee. Because they have a smart point of view, backed by their own relevant personal experience, their voices resonate and elicit support among a huge audience of women. According to their feedback, it’s these initiatives that have more impact on changing the perception of their individual firms among women than any other policy or PR initiative. The optics speak for themselves. If you want to attract senior female talent and younger millennials (and everyone in between), then you have to get to grips with what drives the audience. We live in an era when tech titans and entrepreneurs dominate Rolling Stone magazine, and Bumble’s Whitney Wolfe graced the cover of Fortune and Marie-Claire in the same month. Morgan Stanley secured a huge coup with last year’s Vogue interview of Mandy DeFilippo, MD of fixed-income division, showing that while a career in banking is not without its challenges, it’s also incredibly rewarding. No article on flexible working policies is ever going to make it to Vogue, or engage millennial women. For them gender pay gap is not about pay, it’s about being valued and treated equally in pay and opportunities. Global financial services firms need to quickly learn how to ‘get personal’ by harnessing their best assets, the abundance of smart and personable women that can represent the new face of their organisations in the media, online and among professional communities. Of course, ‘personalising’ a corporate can be a challenge, but that’s where the communications consultants are called in. Internal communications also benefits enormously from a more open approach as it sends the message the organisation doesn’t shy away from difficult personal conversations, so it becomes less terrifying to address them internally. Most companies have invested in manager training but the feedback is that people are still reluctant to discuss certain issues – and this is such a critical factor in retaining senior women. Businesses understand the benefits of getting away from ‘corporate speak’ and sharing relatable stories when it comes to dealing with their people, but many are still risk-averse when it comes to exploring new channels. This is where the power of a professional community such as E2W can be leveraged to great success – as demonstrated by Man Group partnering with E2W to share their messages and value propositions directly with their community of 10,000 senior women in the industry. Using E2W's digital and social channels, head of group operational risk Amendeep Pannu-Purewal was able to personally reflect on her career and the importance that being able to have open and real conversations on have played in keeping her as a ‘lifer’ Man Group. One example she shared was when returning from her first maternity leave, it was advice from a male boss, talking about his own personal experience of family life, that led her to reconsider her options and instead return to working full-time gradually because she was confident she was supported in what is a big challenge for working mums. Another senior women at a global firm credits a very personable South African division boss with giving her confidence to reclaim her place in the pecking order. On her nerve wracking first day back after maternity leave, he marched over, slapping her (gently) on the back saying, ‘Here she is, back in the seat, bloody deserves a medal, I have three kids at home and I don’t know how my wife does it’.. .Then he bellowed at her male boss, who had barely acknowledge her change in status: ‘Go easy on her, she’s probably been up all night and already done more than the rest of you useless idiots before even coming to work’. While probably not the approach advocated in manager training, it does demonstrate an organisation’s best assets are its people when it comes to successfully navigating a course through the new gender diversity landscape, and encouraging everyone to bring their own life experiences into the office. Sue Carter is director of Ashlone Consulting, a communications consultancy specialising in gender diversity issues, and works with clients to help them communicate more successfully around gender issues and achieve greater stand-out in the market. If you are interested in further advice or developing a new communications strategy then get in touch on sue.carter@ashloneconsulting.co.uk or 07876632598.